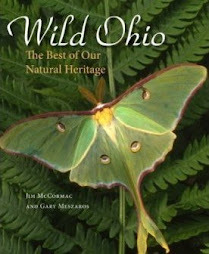 On December 1st, Doug Overacker made an interesting report to the Ohio Birds Listserv. He, Julie Karlson, and Larry Jeanblanc had discovered what appears to be a very noteworthy hybrid duck. 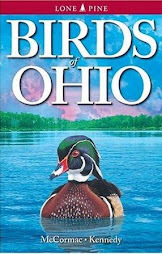 They found the bird at a park in Springfield, Ohio that is well known for the numbers and diversity of migrant waterfowl that stop to rest and refuel there. Being keen on all things waterfowl, I asked Larry - who imaged the bird - if he would allow me to share some of his photos. He kindly agreed, and here they are. These photos are actually from yesterday, when Larry went back found the odd duck still in residence. I believe it was still there today. 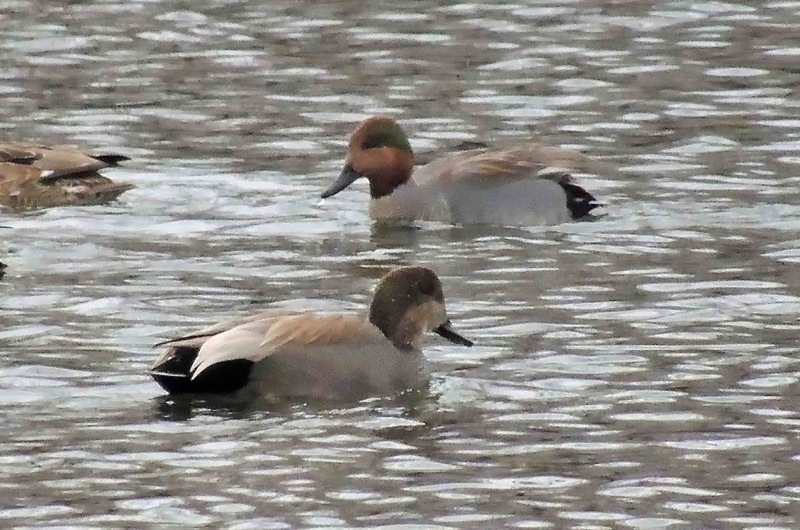 If you're a student of waterfowl, this bird will instantly remind you of two species, just as it did to Doug, Julie, and Larry when they discovered it. 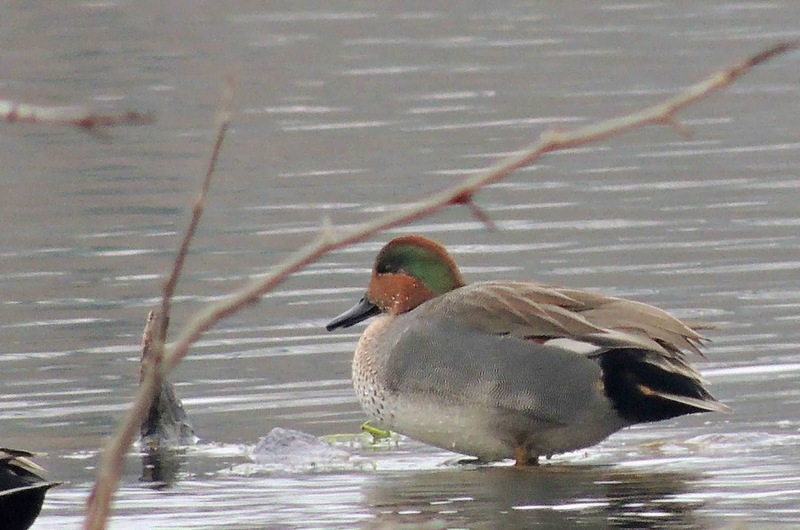 It's as if a Green-winged Teal (Anas crecca) and a Gadwall (A. strepera) were welded together. 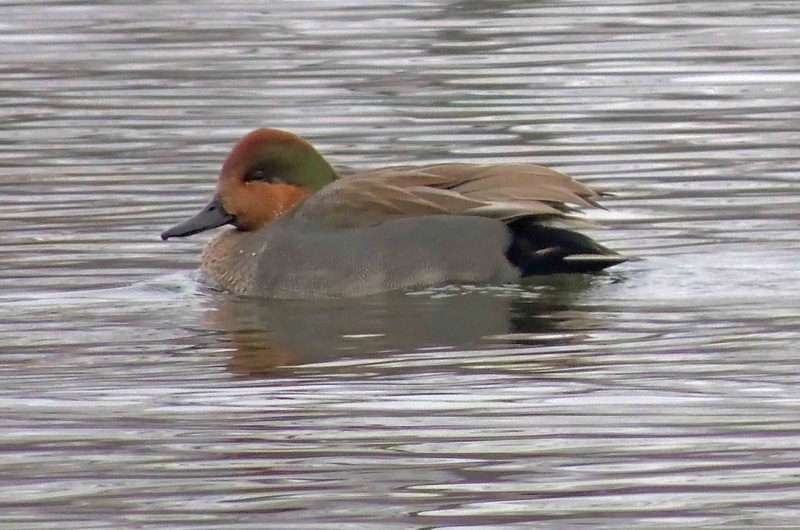 The head and breast are totally teal, while much of the remainder of the bird recalls features of the Gadwall. Traits of the latter are the conspicuous charcoal-black rump, beautiful gray vermiculations on the sides, smoky-brown upperparts, and the white and cinnamon on the wing. 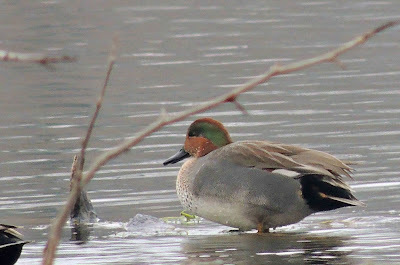 I had never heard of a Green-winged Teal x Gadwall, hence my interest in their find, and desire to share Larry's photos. A typical Gadwall with the hybrid. Our cross is consorting with a hundred or so Gadwall. I delved into the literature to see what I could find about this weird combination, and there's little to be found. 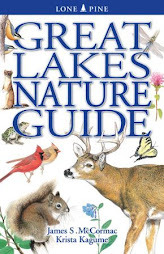 The Birds of North America monographs do not mention this pairing under either species' accounts, nor do other sources that I checked. Finally, I came across a waterfowl hunting website, and there I found a post from a waterfowler in Kansas who took one of these hybrids on November 16 of this year. He doesn't say the exact locale where he shot the bird, but the post and photos are RIGHT HERE. Waterfowl are notorious for jumping the genetic fence and crossing with other species, and hybrid combinations abound. At least 400 different combinations have been recorded worldwide, and waterfowl are the most prolific hybridizers of any family of birds. Keepers of captive fowl encourage many strange pairings, but there are scores of examples of wild cross-breeding. Given the timing and location of this bird as well as its associates, I'd suspect that it was spawned in the wild. 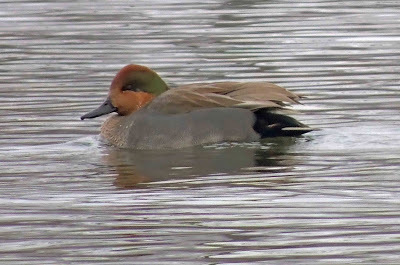 The breeding ranges of Gadwall and Green-winged Teal overlap extensively, so the two species commonly come into contact. 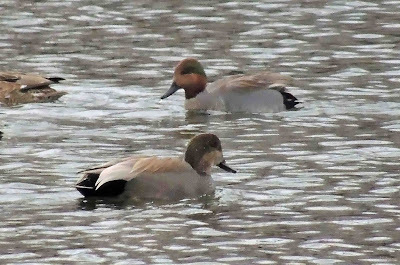 Their size differences must be a formidable barrier to interbreeding, as the comparatively massive Gadwall outweighs the tiny teal by nearly three times. Perhaps that's why this hybrid combo is so scarce. If anyone knows of Gadwall x Green-winged Teal hybrids, please let me know. As cool as this report is, and the one from Kansas, I can't imagine that they are the first to be reported. Thanks to Larry for sharing his photos, and to he, Doug, and Julie for making this find and reporting it. I am not a waterflow student or an avid duck watcher, but I found your blog interesting. 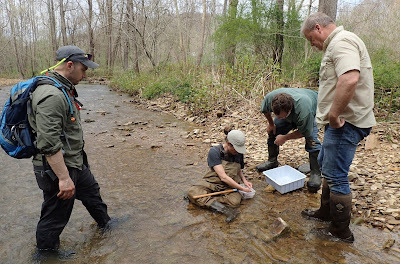 I am currently working on a biodiversity project for a Masters course. I found your thoughts about the ducks hybrid interesting. Do you think all types of birds eventually mate with another type? If so, how many different types do you think you have seen? Do you think they mate with a different type to help with survival? Just a few questions I have if you could take a few minutes of your time to respond that would be greatly appreciated. Snowy Owl in urban Columbus! Golden Eagle on deer carcass! Theft of images. A real problem! Nettie Bay, Michigan: May 2014! The origin of all these Snowy Owls? Snowy Owls invade Ohio (and elsewhere)! "Naming of birds proves baffling at times"